The every iPhone announcement comes with a few revolutionary features, in 2013 the iPhone 5S came with a fingerprint sensor called Touch ID and in 2014 we finally seen a bigger iPhone 6 Plus with a screen size of 5.7-inches. Talking about 2015 launch of iPhone 6S and iPhone 6S Plus, the company came up with all new 3D Touch display. The 3D Touch works by sensing the pressure applied by the touch. It is a new way of interacting with your smartphone just like tapping or swiping the display. The ‘Quick Actions’ and ‘Peek and Pop’ features will work based on 3D Touch. The Taptic Engine designed by the Apple gives that haptic feedback for the 3D Touch. Here are the ten best apps that come with 3D Touch functionality and available for free on App store. While showcasing the 3D Touch at the iPhone 6S launch event, the company has demonstrated few apps and Instagram is one among them. You can quickly post by just hard pressing on the icon, the other Quick Actions includes view activity, search, and direct. The app also includes Peek and Pop features like previewing complete image while you’re in the others profile. With the recent update, home screen icon of the Dropbox comes with 3D Touch functionalities includes showing the recent file along with offline files, upload files, and search option. This all features can be opened without entering the app. The features in the app include press lightly on the file name to preview it and pressing deeper on the preview will take you to the full file or the complete folder. The free version of the popular ‘Camera+’ app has received the 3D Touch gestures and Quick Actions support with the recent update. The icon on the home screen allows you to take photo, selfie, macro, and also allows you to view lightbox without opening the app. WeChat which is the one and only Chinese app that was demonstrated at the launch event is available for free on App Store. 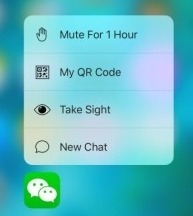 The home screen icon of the app includes options like mute notifications for one hour, showing personal QR Code, Capturing image with app’s camera, and starting a new chat. Earlier to identify a song with Shazam, we need to open the app, but with the new update, just hard press on the home screen icon and the app will start identifying the song. The photo capturing and editing app ‘Hipstamatic’ has integrated the ‘Quick Actions’ and ‘Peek and Pop’ functions in the lastest update. You can directly click on the icon to capture images in different modes like Sunset, Portrait, and Blogger mode. The Quick Actions menu also include the option to edit the last captured image. Spark is one of the best email client app available on app store. 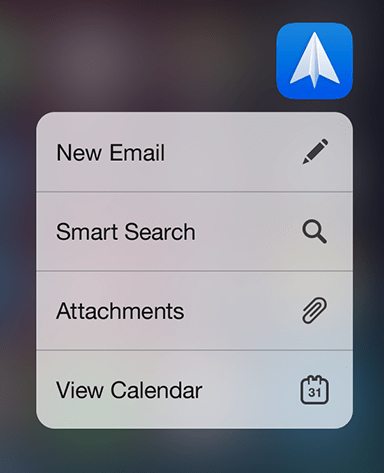 The latest update of the app adds the Quick Actions menu including new mail, search, attachments, and view calendar options right into the home screen icon that can be accessed by hard pressing. The popular social networking app Twitter has updated its iOS app with new 3D Touch features. The Quick Actions menu includes sending a new message or a new tweet along with search function. The link in the app will be previewed directly in the in-app browser instead of opening in the Safari. If you feel bored of playing piano on a smartphone, the Magic Piano app is what you should try to get best of apples latest 3D Touch functionalities, the app can measure the pressure used for touch and plays the sound according to that. 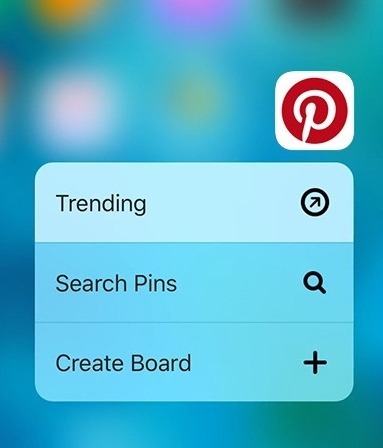 By hard pressing the Pinterest icon shows you the Quick Actions menu including options like trending, search, and create board. In the app, functionalities include ‘Peek and Pop’ options for previewing images. Press the board name of the particular image to preview the whole board. Scan your documents on the go is now got better with Genius Scan app. The Quick Actions menu offering the following selections: Scan with Camera, Scan from Photos or Scan from Cloud. You can quickly scan the document and save them in PDF or JPG file formats. 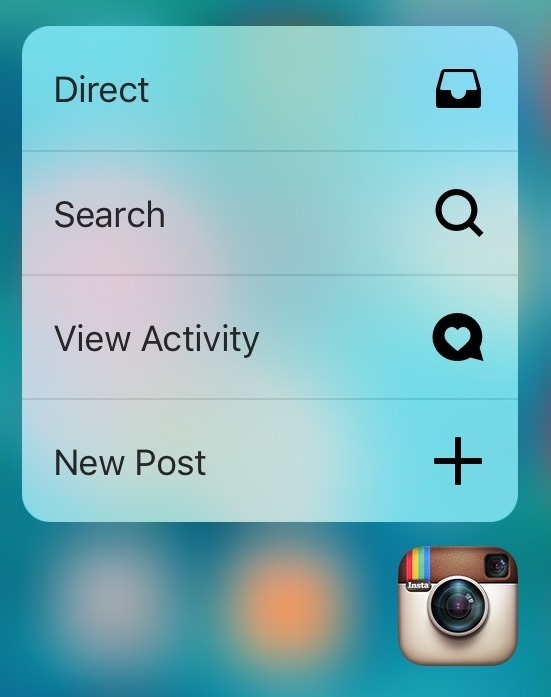 In the coming days, we can expect more features to be added that can function using the 3D Touch. As of now only small number of developers had integrated the 3D Touch technology but in the future there will be more apps with this new feature.